Why should we use estimation? In real life, many times we are caught in a situation when we are more interested in getting close to the right answer instead of finding the precise answer. While most of us are happier finding the exact or precise answers, there are times when we would trade precision for speed and ease of calculation. Imagine you are in a grocery store and you see that tomatoes are $1.85 per pound. You have to buy 8 pounds of tomatoes but have only $20 on you. Now, without the aid of a calculator can you decide if you have enough money to buy 8 pounds of tomatoes? There are many such situations in our everyday life when we need to make quick decisions, and in such cases estimation strategies come in very handy. Let’s think how we can make a quick decision in such a situation. Because tomatoes are $1.85 per pound, we can approximate it to $2 per pound (we are overestimating the value of tomatoes in this case). Now, 8 pounds of tomatoes at $2 per pound will cost you $2 * 8 = $16. Because we have overestimated the per-pound price of tomatoes, we can assume the price of 8 pounds of tomatoes is going to be less than $16. So, we can buy 8 pounds of tomatoes with our $20. 1) Rounding off: One of the most popular strategies for estimating is rounding off. Example 2: Let’s say we have to compute 25.35 * 12. We can round 25.35 down to 25, and then do the calculation. Example 3: Let’s now learn how to round off decimal numbers to integers. If that digit is greater than or equal to 5, then add 1 to the first part of the decimal number. If the first digit after the decimal point is less than 5, then write the whole number part (or first part) of the decimal number as the rounded value. In case of 124.65, the first digit after the decimal point is 6. Hence, we will add 1 to the first part, which is 124. So decimal number 124.65 can be rounded off as 124 + 1 = 125. Now let’s take 233.25. The first digit after the decimal point is 2, which is less than 5. Hence, our rounded off value is 233. Example 5: Assume there are 38 students per math class and there are 19 such math classes. What is the total number of math students in the school? If we are not looking for a precise answer, we can estimate the total number of math students in the school using approximation. 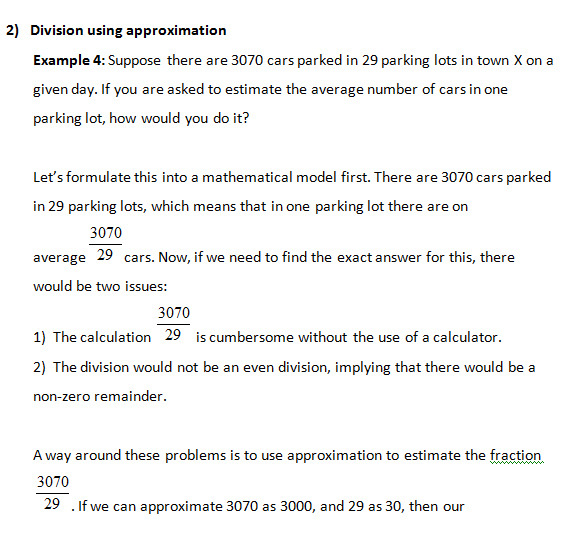 Now approximate 38 to 40 and 19 to 20, and use these approximations to estimate the number of math students. 4) Approximating fractions: Proper fractions can be approximated using the rules for rounding off decimal values. If you want to approximate a proper fraction, a good place to start is to figure out whether the value of the fraction is greater than 1/2. Divide the denominator of the fraction by 2, and let the quotient be called q. If your numerator is greater than q, then approximate the fraction by 1, or else approximate it to zero. Calculate the decimal value of the fraction and use the rounding off rules for decimals to approximate the fraction. The decimal value of 3/4 is .75. Hence, we will approximate it to 1. Example 7: To approximate 8/5, express the fraction as a mixed number 8/5 = 1 3/5. This means 8/5 = 1+ 3/5. Now approximate 3/5 using the rule given in  above. You will realize that 3/5 can be rounded to 1. Thus, 8/5 will be approximated to 2. Example 8: Alternatively, you can find the decimal value of 8/5 and approximate it using the rules given in . The decimal value for 8/5 is 1.6. So, using the rules in , this can be rounded off to 2. In this section, we will apply our knowledge of estimation to real-life situations. Example 9: In an 8-hour work shift, Josh services 26 computers. How many computers per hour did Josh service? Give both the actual answer and the estimated value. Solution: In 8 hours, Josh services 26 computers. Therefore, in 1 hour, Josh services 26/8 computers. Hence, the approximate number of computers serviced per hours is equal to 3. Hence, the actual number of computers serviced per hour is 3.25. Which value should we use: approximate or actual? So, which value would you like to go with: approximate or actual? In the last example, 3.25 computers does not sound plausible. The number of computers should be a whole number (0, 1, 2, 3 …). Therefore, in the context of this problem, we should report approximate value as the number of computers serviced per hour. While precise estimates are desirable, they are not always right in the context of the problem. We should be careful in understanding what value we are calculating and what it stands for. Based on that, we can decide whether we should use the actual value or the approximate value. It is possible that there is more than one approximate value for a variable. Depending on the strategies we use, we might come up with more than one “right” answer. But the closer we are to the actual value, the better our estimation or approximation strategy is. The decimal is rounded off. Hence it is 36. 8.28 can be rounded off to 8. The approximate value of 1.003 is 1. The approximate value of 4.65 is 5. In 24.98 the number next to the decimal point is 9.